(Alex Brandon | AP Photo) Sen. Orrin Hatch, R-Utah, listens to a reporter's question after a Republican lunch meeting on Capitol Hill, Wednesday, Sept. 26, 2018 in Washington. Washington • Senate Finance Committee Chairman Orrin Hatch, R-Utah, said Wednesday that it’s “highly unlikely” the Senate would vote after the election on President Donald Trump’s new proposal for a 10 percent middle-class tax cut. Hatch said it would require "monumental effort" for the Senate to pass any such proposal. He added, "I've seen miracles happen before." 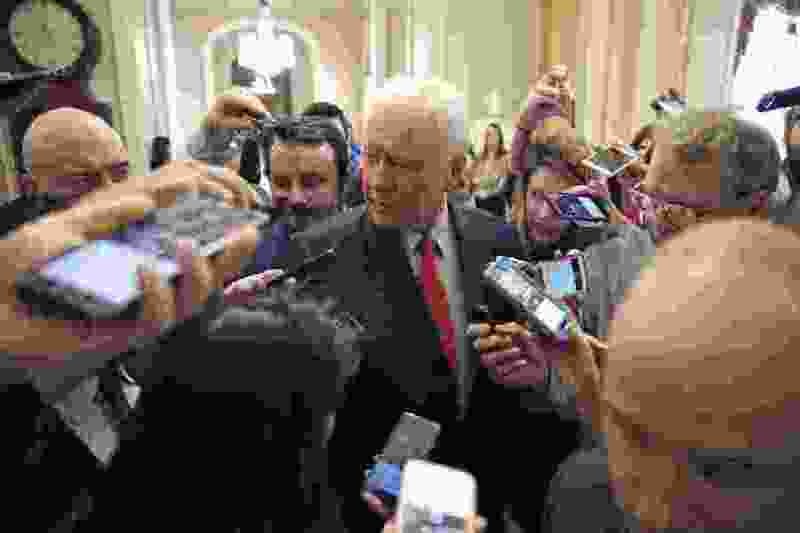 Hatch also told reporters on Capitol Hill that he had few details of the proposal, which his committee would be charged with shepherding. Trump's idea took lawmakers by surprise when the president first discussed it over the weekend. Asked whether there actually is such a proposal, Hatch said, "I think there will be." Hatch's comments underscored the chaotic nature of Trump's approach to announcing a proposal that would be a major - and costly - change to the nation's tax code. Trump on Tuesday suggested Republicans would soon unveil a non-binding "resolution" that would put lawmakers on record in favor of a future 10 percent middle class tax cut. The resolution could be rolled out as soon as this week, but Congress is gone until the middle of November and could note vote on it before then. Trump's proposal comes two weeks ahead of midterm elections that will decide control of Congress, and Republicans look to bolster their case as capable stewards of the economy. The GOP tax law that went into effect this year has grown unpopular because of the public's perception that it mostly helps well-off people and corporations, and Trump has called on his team to find new ways for Republicans to communicate their message. Hatch sidestepped when asked whether he'd discussed the idea with the president, saying, "We talk all the time." "I can't say I don't know anything about it," Hatch said. "But, you know, he's an interesting man and he's a very good leader. And he he does things the way he wants to do them and he's been pretty successful so far so I'm going to be the last to criticize him, I'll put it that way." Asked about the idea of passing a resolution, Hatch said, "I don't have it yet so I'll wait and see what he what he does. I'll be happy to listen to him in every way. "We're in the middle of a very contentious tough year so we'll just have to see," Hatch added. He said he believed the Senate ultimately could pass such a tax cut, but "it would be very difficult at this particular time." Hatch acknowledged that ultimate passage of a new tax cut would require Republicans to retain their congressional majorities. "The Democrats don't like tax cuts. We love them," Hatch said. "We think they stimulate the economy benefit the economy and get our economy moving better than ever. So I'm a big supporter of tax cuts." Hatch said he had not yet discussed the issue with Senate Majority Leader Mitch McConnell, R-Ky., but would do so.